The Round: a quick baptistry to set up, fill and take down. With a double liner, and FS speedy set up, it is ideal for churches meeting in borrowed premises. It is also a perfect smaller option if you’re baptising younger believers or don’t mind a shallower pool. This is our original model and one of our favourites. The round baptistry is simple, quick to fill and well insulated. Like the Galilee it comes with a double liner as standard. A baptistry of this size and insulation can easily be heated purely by using a hot tap, making it perfect for churches where a quick set up and take down is a priority. While it’s most popular for baptising those with mobility issues and younger candidates, it also works with adults if they kneel. Rating for set up: Easy for two people. four panels; double liners; nuts and bolts; foam base mats; a submersible pump; an insulating floating top; puncture repair kit. Three options on piping: 10m hosepipe to fill and 10m crushproof pipe to empty OR 15m crushproof piping OR 15m layflat piping. 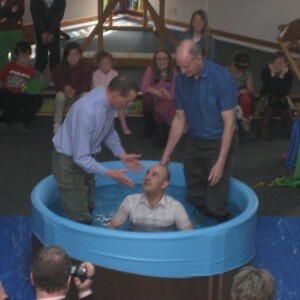 Round Baptistry, BaptistryUK from Baptistryuk on Vimeo.